September 2013—This is not a question I am asking you, but a reminder that this may be the “magic question” to pose to your manager. This may just be the question that gets him thinking about his own career start, and may soften his heart to your request to attend an AHRA conference. Think back to what got you motivated to be a better manager. What was it? Was it an outstanding mentor? Was it a manager who drew you in and got you involved? Maybe he took you to your first AHRA meeting. I have been blessed to have worked with two excellent directors in the past. Both of these folks were very transparent with me, and they allowed me insight into their roles and scopes of responsibility. For that I am thankful because it prompted me to want to do the good work that they did. I have tried very hard to do the same for others I work with. It really helps to build a great team. The other key thing they both did was to bring me along with them when they attended AHRA’s Annual Meetings. This was such a wonderful opportunity. I was amazed at how much information flowed through those breakout sessions. If you have attended in the past, you know that the meeting actually changes you! It boosts your confidence immensely the first time you sit in a classroom and are surprised to find that you have comrades all across the country who are dealing with the same issues you are. To hear that the same struggles and successes are shared makes an incredible difference in the way we do our everyday jobs. I hope my fellow repeat attendees would agree that your energy level greatly increases in the weeks and months after the meeting. The education and fresh ideas give us all that boost we need to be better leaders. Few of us are resident experts at everything we are responsible for, but somewhere in the AHRA family, you can find the answers and coaching you need. 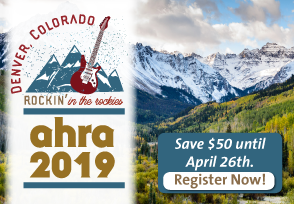 One of the best things about attending an AHRA conference is the opportunity to network, either between sessions at the meeting or during the social events. The AHRA has taken great strides with the new membership models, making it more feasible for us to have our supervisors and lead techs involved too. We need to take advantage of that great deal and encourage them by allowing them to get involved just like you and I did. If you’re planning on attending the Fall Conference Advanced Track, why not bring a mentee to attend the Basic Track? Or if you attended the Annual Meeting, send one of your colleagues who stayed behind to attend the Fall Conference. We hear all the time about budgets being tight or cut, and attendance at meetings being more difficult. I challenge you to ask your boss the question above. Ask him what made him a better manager. Ask him how he felt once he started to get involved in a bigger way with a group of experts in his field. You may just get him thinking and remembering that we all need that energy that comes from attending an event with our peers and that the returns are great. It’s also a valuable opportunity to work on succession planning: we all need great managers and supervisors to take our places some day! Peggy Pust, CRA, FAHRA, MBA is the vice president at Monongalia General Hospital in Morgantown, WV. She can be reached at pustp@monhealthsys.org.